z o the steel may be bent around in a close curl. The lever is bent around the cylinder of steel in the same wa.y the tang was bent. If the lever is of the loop type, such as is often found upon a rifle, the bending is a more complicated process. 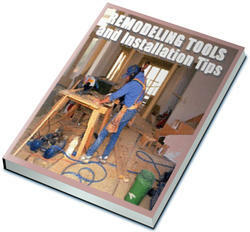 It is best done in an arbor press, using three steel rods or brass rods, but it can be done with a vise. 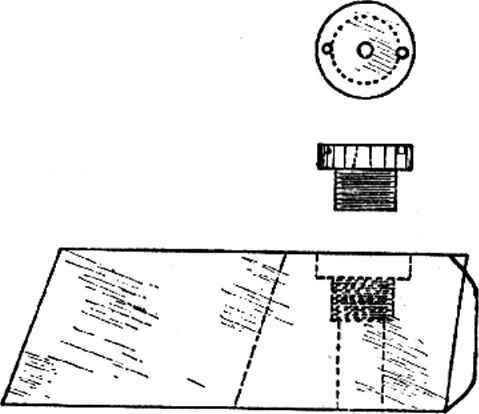 In doing it on a press, two rods are laid on the pressure plate of the press, spaced a short distance apart, and the lever is laid upon these, bottom up, then the third rod is laid upon-the inner surface of the back strap of the lever, midway between the other two rods. A piece of heavy strap-steel is bent to the shape of a square-U, so that its open ends may be placed upon the third rod, and the ram of the press brought down upon the bottom of the U, which is turned upwards above the front strap of the lever. Pressure is now applied and the rods moved along as is necessar}' to make the proper bend. The front strap of the lever can usually be bent by direct pressure of the ram of the press, bending it a little at a time as you move it, so that no sharp kinks develop in it, until it parallels the back strap. This same job can be done in a vise if the ends of the rods used in the bending process are bent over at a right-angle, so that the rods will hang in place on the vise jaws but, due to the width of the vise jaws you do not have the clearance that you have in an arbor press for the lever to make its curve. This can be corrected in bending the back strap by using a steel cylinder against the movable jaw of the vise, between it and the lever. necessary to prevent the primers puncturing from high pressures of 35,000 pounds or more per square inch. Flange-type bushing for firing-pin nose as fitted in breech block of single-shot action. near the outer edge of the flange of the bushing, at each side, opposite each other, and a pin spanner wrench is made with pins to fit the holes, so that the bushing may be screwed into place. The threads should fit very tightly so that there is no chance for the bushing to loosen. A piece of drill-rod that will just slip down the bore and which is slightly longer than the rifle barrel is pointed, centrally, on the end and the point hardened. 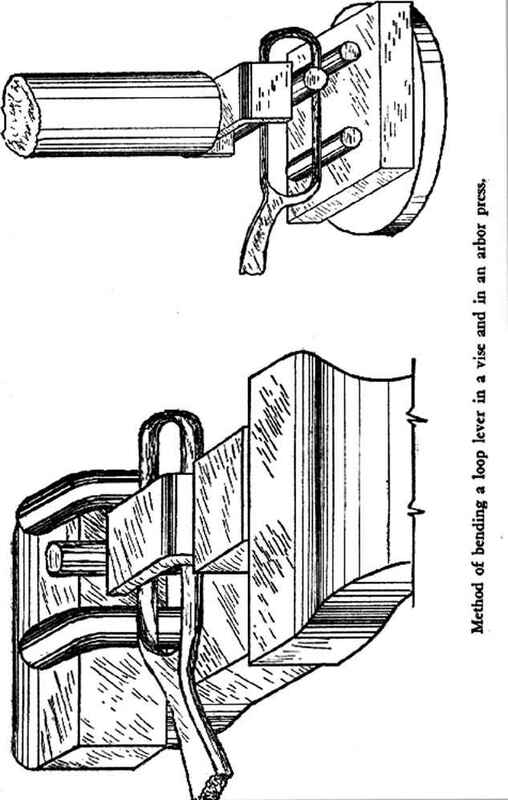 The breech-block with the bushing in it is placed in its fully closed position in the action and the rod is tapped on the outer end, to mark the location of the bore center on the breech-block bushing. The breech-block is then removed and, with the block in a vise on the drilling machine, the firing-pin hole is drilled in from the face of the breech-block. Make sure that the breech-block is tilted at the proper angle in the vise, so that the original hole in the breech-block for the body of the firing-pin is vertical to the table of the drilling machine. The firing-pin hole in the bushing is first drilled with a Vis" center-drill and then redrilled with a #44 wire-gauge drill, after which it is reamed from the rear, either with a firing-pin reamer or a tapered broach reamer. I prefer the tapered English broach reamer for this work, so that the firing-pin hole is slightly relieved just back of the face of the bushing. This can also be reamed with a small, round, tapered Swiss-type file turned in a left-hand direction. As the firing-pin hole through the bushing may not be central with the original firing-pin body hole in the breech-block, it will be necessary to make a firing-pin with an off-center nose if this is the case. The original firing-pin, if it is an odd shape, may be cut off square, after being annealed, replaced in the breech-block and the location of the off-center nose located with a drill run through the firing-pin hole in the bushing. The old pin is then drilled and tapped for a piece of chisel-steel to be screwed in and turned up for a new nose, after which it is hardened and the temper then drawn to a deep blue, in oil. The bushing is removed from the breech-block, hardened, the temper drawn in oil at a dark purple and the bushing replaced in the block. Cheek the surfacc carefully to see that it is flush with the face of the breechblock, if not grind it down flush and polish it. Straight-type bushing £or firing-pin nose as fitted to breech block. method is applicable to the Winchester single-shot actions because of the fact that the thickness of the head of cartridges used determines just how high the breechblock rises in closing this action, so even if the firing-pin hole location is marked centrally with the bore, there is no assurance that the firing-pin will always strike a primer centrally. Firing-pins should have a protrusion of .050" beyond the face of the breech-block when in the fired position, with the exception of those in the Sharps Borchardt action. These latter firing-pins must be made with as little protrusion as possible and still fire the cartridge with certainty, for this breech-block moves straight down when the action is opened but it starts to move down before the firing-pin begins to retract so that the nose of the firing-pin is dragged partly through the primer before being retracted mechanically, which results in a broken firing-pin if the protrusion of the pin is greater than .040" beyond the face of the breechblock, and .035" is better yet, if it will fire with certainty every time. There will be a variation in the thickness of heads of rimmed cases, so this firing-pin protrusion on this Sharps action must be carefully checked with several different makes of cases, to be sure that primers will fire every time. Lock-time on these single-shot actions may be speeded-up by lightening the hammer, stiffening the main-spring and, in actions of the Sharps Borchardt type, by lightening the firing-pin and shortening the hammer fall or the firing-pin travel. While shortening lock-time usually results in better accuracy, this is not always true and this especially applies to rim-fire actions, as these seem more sensitive to variation in firing-pin blow than do the center-fires. Some target barrel makers refuse to guarantee as good accuracy with shortened lock-time in the .22 long-rifle as they will with a standard lock-time. In the open-hammer type actions, the hammer maybe lightened by drilling holes in the web below the hammer spur, or by cutting a triangular-shaped piece out of this web. A second method is to cut a new cocking notch farther forward than the original, so that the hammer travel is shortened. As hammers are hardened, it will be necessary to anneal them before making any cuts or holes in them and then reharden them afterwards. 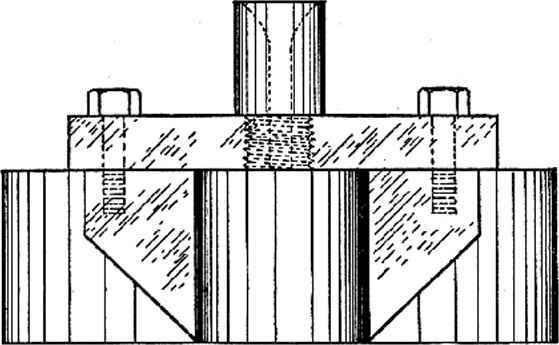 If the hammers are lightened, or their travel shortened, a stiffer main-spring is nearly always necessary to produce a heavy enough blow to fire the primer properly. In the flat main-spring type, this is easily accomplished by making a heavier spring, which increases the tension on the hammer, or by fitting a block or tension-screw so that the bend of the spring is shortened in use. Methods of lightening Winchester and Stevens hammers, so as to increase speed of travel. bolt.-act.ion type where space around the firing-pin is too limited to use a heavy enough spring of round wire. How to repaire firig hol?